Download the Synergy 1.3.1 Installer and the Synergy Broadcast Patch from the links above. Run the Synergy 1.3.1 installer on both computers. Copy the contents of the Synergy Broadcast Patch over the top of the same files in c:\Program Files\Synergy (or wherever you installed it). These modified executables allow keystrokes to be braodcast to multiple computers. Press the Configure button to bring up the Configuration dialog. Use the + button to add a screen name for both computers, the client and the host. Use the normal network names for the PCs. Then create a couple of rules describing the relationship of the two monitors, using the drop boxes. This tells Synergy how it should allow the mouse to move from one desktop to another. 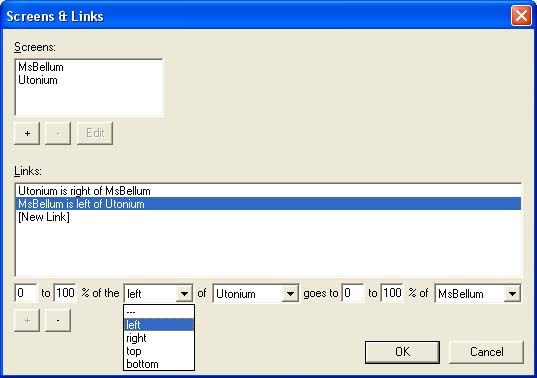 In my example below, my main computer (Utonium) sits to the right of my second computer (MsBellum) and so I want to be able to run the mouse off the left edge of Utonium and have it appear on the right edge of Ms Bellums screen and vice versa. Once this is done, press Start. Synergy will show you a message box and possibly log window, which you can close, and will appear on your Start Bar. 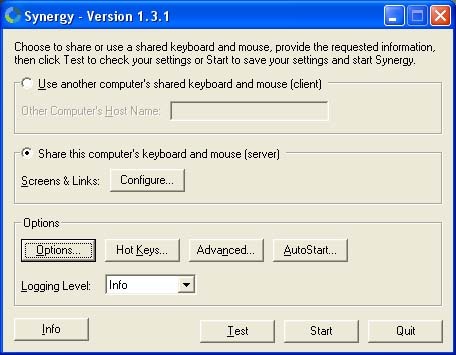 On the client computer, when you start up Synergy, select Use another computer's shared keyboard and mouse (client) and enter the screen name of your host computer. Start it up, and it should then detect the host running. Move the mouse from the main computer and it should now appear on the client. Open up a Notepad on each computer, and select each programme with the mouse from the main computer. This should slide smoothly from one monitor to the next. Return the mouse to the main computer and type in notepad. The text should appear on both computers. Activate NUM LOCK. The text will no longer be broadcast. Press ENTER. The ENTER will not get broadcast to the auxiliary computer. This is by design, to prevent unwanted chat being sent. When Synergy is running, you can close it by right clicking on the Start Menu icon and choosing Quit. It will memorise the configuration, so to start it up for a session, just run the executable on each machine and press Start, you only need to set up the configuration once. Run the City of Heroes Dual Box Binds installer. This will create a foilder on your C drive called Binds, with subfolders "main" and "auxiliary" both containing an active.txt and a passive.txt. Copy the contents of main to the C:\binds folder of your main computer (so that its c:\binds\active.txt and c:\binds\passive.txt). Copy the auxiliary/binds folder to the C:\binds folder of your auxiliary computer. 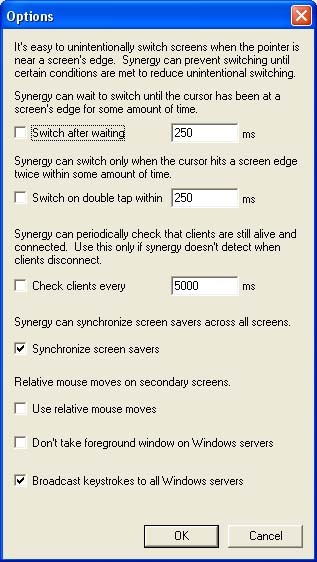 Make sure Synergy is running on both computers. Create your characters, and enter the game with them. Make sure NUM LOCK is not active on the main keyboard. Rearrange your power icons in the main tray into the same order for both characters, or an order that makes sense if they have different abilities. and press enter on both keyboards to make this command take. You should see some spam in both chat windows as the binds are registered. This will need to be done for each new character. Now press F9 to set the auxiliary character to auxiliary mode. WASD should now move the main character, and the cursor keys move the auxiliary. Have the main character invite the auxiliary character to team. You can accept by scrolling the mouse over to the second computer. Press Numpad keys 1 and 2 to make the characters select each other, and Numpad 9 to get the auxiliary on follow. You can now use any ally buff powers on each other. If you don't have any yet, run off to find a bad guy. TAB target with the main character, and the auxiliary will follow and target through them. Press an attack key to get them attacking in unison. Congratulations! You should now have defeated your first enemy in duo mode!